Driloleirus americanus is a large, pinkish-white earthworm as much as 3 feet long, said to smell like lilies when handled. Threatened by habitat loss (Palouse bunchgrass prairie) and non-native worm species. The worms' burrows are as deep as 15 feet. They were reportedly abundant in the late 1800's around the Palouse. Cass Davis of Latah County discovered what he believes are three specimens of the extremely rare Giant Palouse Earthworm. The finding occurred over the past weekend on Paradise Ridge. "I submitted two specimens to the University of Idaho from Paradise Ridge in 2012," said Cass Davis. "Since then, I have been searching for more but have been unsuccessful, until the other day. I'm very confident that these three new specimens are also the rare Giant Palouse Earthworm." 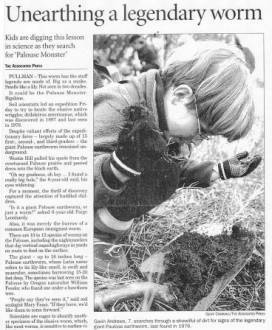 The Giant Palouse Earthworm was considered by some scientists to be extinct until a 2005 discovery by a University of Idaho graduate student in Albion, WA. In 2010, another university graduate student, along with a research support scientist, found two more worms that were eventually confirmed. "It's really cool that potentially a few more Giant Palouse Earthworms have been found on the ground surface here in the Palouse," stated David Hall of the Palouse Prairie Foundation. "It is important to preserve the habitat in which they live. There are probably very few left, and they may have an important role in production of the great soils we have here." The native Palouse Prairie is recognized as one of the most endangered ecosystems in the United States. There is less than 1% of native prairie remaining. "These giant earthworm specimens provide additional evidence concerning the importance and uniqueness of Paradise Ridge and the Palouse region," said Tim Hatten with the Moscow-based Invertebrate Ecology. "Whether it's rare plants, rare worms or native pollinators, they are all important pieces to what's left of the Palouse Prairie and they deserve protection." The Giant Palouse Earthworm is native to the Palouse region and is one of the few native worms in all of America. After receiving a petition by conservationists to list the worm under the Endangered Species Act, the US Fish & Wildlife Service ruled in 2009 that there was not sufficient data to warrant listing. "After the Palouse Prairie was reduced to wheat and lentil fields at the beginning of the 20th century, there have only been about a dozen Giant Palouse Earthworms found by scientists and volunteers," said Steve Paulson of Friends of the Clearwater. "It is time to protect the Giant Palouse Earthworm. Failing to protect the worm would be the equivalent of throwing away our heritage." Several Giant Palouse Earthworms found on a road on Paradise Ridge. SUMMARY: We, the U.S. Fish and Wildlife Service (Service), announce a 12-month finding on a petition to list the giant Palouse earthworm (Driloleirus americanus) as threatened or endangered as petitioned, and to designate critical habitat under the Endangered Species Act of 1973, as amended (Act). After review of all available scientific and commercial information, we find that listing the giant Palouse earthworm is not warranted at this time. However, we ask the public to submit to us any new information that becomes available concerning the threats to the giant Palouse earthworm or its habitat at any time. DATES: The finding announced in this document was made on July 26, 2011. SUMMARY: We, the U.S. Fish and Wildlife Service (Service), announce a 90-day finding on a petition to list the giant Palouse earthworm (Driloleirus americanus) as threatened or endangered under the Endangered Species Act of 1973, as amended, (Act) and to designate critical habitat. Based on our review, we find that the petition presents substantial scientific or commercial information indicating that listing the giant Palouse earthworm as threatened or endangered may be warranted. Therefore, with the publication of this notice, we are initiating a review of the status of the species to determine if listing the giant Palouse earthworm is warranted. To ensure that this status review is comprehensive, we are requesting scientific and commercial data and other information regarding this species. Based on the status review, we will issue a 12-month finding on the petition, which will address whether the petitioned action is warranted, as provided in section 4(b)(3)(B) of the Act. DATES: To allow us adequate time to conduct this review, we request that we receive information on or before September 20, 2010. Petitioners-Appellants petitioned the U.S. Fish and Wildlife Service to list the giant Palouse earthworm as an endangered or threatened species. The Service issued a negative 90-day finding that rejected the petition, concluding that there was insufficient evidence to indicate that the earthworm may be threatened. Petitioner-Appellants brought suit in the Eastern District of Washington, claiming that the Service applied the wrong standard in its 90-day finding. The district court granted summary judgment to the Service. We affirm the district court. Giant Palouse Earthworm -- The Fight For Survival; Round Two (from Friends of the Clearwater's Clearwater Defender newsletter). Arguments before United States Court of Appeals for the Ninth Circuit, William Fletcher and Johnnie B. Rawlinson, Circuit Judges, and Arthur Lawrence Alarcón, Senior Circuit Judge. Attorneys John Buse and John Arbab. PORTLAND, Oreg. – Friends of the Clearwater, Center for Biological Diversity, Palouse Prairie Foundation, Palouse Audubon and Palouse Group of Sierra Club filed a petition today with the U.S. Fish and Wildlife Service requesting that the agency protect the giant Palouse earthworm as an endangered species. The earthworm has been found only four times in the past 110 years, including in 2005, and is immediately threatened by agriculture, urban sprawl, and invasive earthworms. "The giant Palouse earthworm is critically endangered and needs the protection of the Endangered Species Act to have any chance of survival,? said Noah Greenwald, biodiversity program director at the Center for Biological Diversity. ?Sometimes reaching three feet in length, white in color, and reportedly possessing a unique lily smell, the giant Palouse earthworm is found only in eastern Washington and northern Idaho and would be a tragedy to lose." Under the Bush administration, the U.S. Fish and Wildlife Service rejected a previous petition from the groups to protect the earthworm, arguing that there was not enough information about the species. This move was typical of the administration, which adamantly opposed protecting species under the Endangered Species Act. Indeed, the administration protected only 62 species in eight years, compared to 522 species protected under the Clinton administration. In submitting the new petition, the groups provided additional information demonstrating the extreme rarity of, and severe threats to, the species. "The giant Palouse earthworm has lost the vast majority of its habitat to agriculture and urban sprawl," said Steve Paulson with Friends of the Clearwater. ?Indeed, the Palouse Prairie, which comprises much of the earthworm?s presumed range, is considered one of the most endangered ecosystems in the U.S., with less than two percent remaining in a native state.? Sightings of the earthworm have all been in areas with native vegetation in the Palouse prairie region of eastern Washington and northern Idaho or around Ellensburg, Washington. The earthworm appears to need moist soils with native vegetation. Recent surveys of both native habitat and former agriculture areas found only introduced earthworms, with one exception: In 2005, a researcher from the University of Idaho found a single giant Palouse earthworm in an area of native vegetation near Moscow, Idaho. 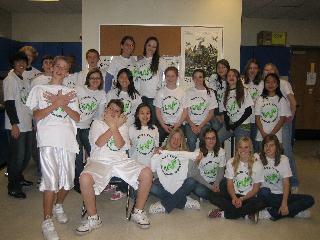 Emily Smart's class designed and printed T-shirts as a fund-raising effort. ACTION: Notice of 90-day petition finding. SUMMARY: We, the U.S. Fish and Wildlife Service (Service), announce a 90-day finding on a petition to list the giant Palouse earthworm (Driloleirus americanus) as threatened or endangered under the Endangered Species Act of 1973, as amended. We find that the petition does not provide substantial scientific or commercial information to indicate that listing the giant Palouse earthworm may be warranted. Therefore, we will not be initiating a status review in response to this petition. However, we encourage the public to submit to us any new information that becomes available concerning this species. The giant Palouse earthworm was first described by Frank Smith in 1897 after he discovered it near Pullman, Washington: "* * * this species is very abundant in that region of the country and their burrows are sometimes seen extending to a depth of over 15 feet." The petition stated that since the initial description of the giant Palouse earthworm, sightings have been extremely infrequent. 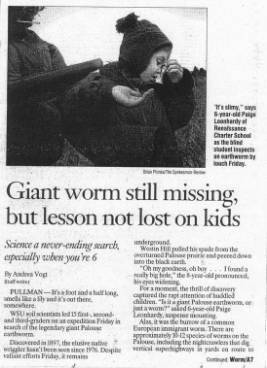 In 2005, a University of Idaho graduate student conducting soil samples was the first person in nearly two decades to report a sighting of this earthworm (University of Idaho 2006, p. 1). Prior to this sighting, two specimens were collected in 1988 by University of Idaho researchers studying pill beetles in a forest clearing. A specimen was also collected by Fender in 1978 (Fender 1985, pp. 93--132). An indication of the species? rarity is documented by Fauci and Bezdicek (2002, pp. 257--260); they surveyed earthworms at 46 sites in the Palouse bioregion without one collection of the giant Palouse earthworm. This letter provides you with 60 days notice that the Center for Biological Diversity, the Palouse Prairie Foundation, the Palouse Audubon Society, the Friends of the Clearwater, Steve Paulson, David Hall and O. Lynne Nelson ("Petitioners") intend to sue the U.S. Department of the Interior, the Secretary of the Interior and the U.S. Fish and Wildlife Service (collectively "the Service") for violating Section 4 of the Endangered Species Act ("ESA"), 16 U.S.C. § 1533, and its implementing regulations, in failing to issue a 90-day finding or a 12-month finding regarding Petitioners? petition requesting threatened or endangered listing for the Giant Palouse Earthworm (Driloleirus americanus). This letter is issued pursuant to the 60-day notice requirement of the citizen suit provision of the ESA. 16 U.S.C. § 1540(g). This letter responds to your petition dated August 18,2006, requesting the U.S. Fish and Wildlife Service emergency list the giant Palouse earthworm (Driloleirus americanus) and list this species as threatened or endangered pursuant to the Endangered Species Act of 1973, as amended (Act). We received your petition on August 30, 2006. When reviewing a petition, we must make an initial finding on whether the petition to add a species to the endangered species list presents substantial information indicating the requested action may be warranted. Section 4(b)(3)(A) of the Act requires, to the maximum extent practicable, this finding be made within 90 days. We reviewed your petition to issue an emergency rule to list the giant Palouse earthworm. Our assessment is that circumstances pertaining to the status of the species do not warrant emergency listing. If conditions change, and we determine emergency listing is warranted, an emergency rule will be developed. We are currently required to complete a significant number of listing and critical habitat actions in Fiscal Year 2006, pursuant to court orders and judicially approved settlement agreements. Complying with these court orders, settlement agreements, and other priorities obligates all of our listing and critical habitat funding for Fiscal Year 2006. Therefore, while we are not able to further address your petition to list the giant Palouse earthworm as endangered or, alternatively, as threatened, we will address your petition as soon as funding becomes available. If you have any questions concerning this matter, please contact Ms. Theresa Rabot, Assistant Regional Director - Ecological Services at 503-231-6151. The petitioners hereby formally petition to list the Giant Palouse Earthworm (Driloleirus americanus) as a threatened or endangered species pursuant to the Endangered Species Act (hereafter referred to as ESA), 16 U.S.C. §1531 et seq. This petition is filed under 5 U.S.C. 553(e) and 50 CFR 424.14 (1990), which grants interested parties the right to petition for issue of a rule from the Secretary of Interior. Petitioners also petition that critical habitat be designated for the Giant Palouse Earthworm concurrent with the listing, pursuant to 50 CFR 424.12, and pursuant to the Administrative Procedures Act (5 U.S.C. 553). The Giant Palouse Earthworm (Driloleirus americanus) is an endemic species of the Palouse bioregion that utilizes endangered Palouse prairie grassland habitat and nearby associated habitats. Habitat for this species has suffered extreme destruction and modification, due primarily to conversion of native grassland to non-native annual crops. Additionally, grazing, suburban and rural development, road construction and re-construction, and invasive species pose a threat to remaining degraded Palouse habitat and the species. Current and proposed management of the species either does not exist or is inadequate at the federal, state and local levels, to protect the species and its habitat. Without the designation of it as an Endangered Species, the Giant Palouse Earthworm faces an imminent threat to its continued existence in the Palouse bioregion. An earthworm specimen found in a Palouse Prairie remant near Pullman, WA, has been confirmed to be Driloleirus americanus, the giant Palouse earthworm. University of Idaho graduate student Yaniria Sanchez-de Leon samples a Palouse Prairie remnant south of Moscow for earthworms. She found the rare giant Palouse earthworm at a different site north of Pullman, Wash. The large, white worm at the top is the giant Palouse earthworm, Driloleirus americanus. Below is the southern worm or Aporrectodea trapezoides, which is considered an introduced species. The anterior, ventral view of the giant Palouse earthworm specimen collected by Yaniria Sanchez-de Leon. The scale is in centimeters. Yaniria Sanchez-de Leon, Ph.D. candidate in Soil Science at UI, found the earthworm in the top 10cm of the soil on May 27, 2005 in Festuca-Symphoricarpos association vegetation. Sanchez-de Leon found the wriggler in May while digging soil samples for her research on the effects of earthworms on soil carbon dynamics of the Palouse grasslands. She paused when her shovel unveiled part of the off-white body of the Driloleirus americanus. "I was really excited because it was something different," she said. Its size and coloring are distinct from common species. She extracted two pieces of the worm from her field site at Washington State University's Smoot Hill Ecological Preserve and took them back to her office for identification. They measured 6 inches together, much longer than a common European worm. Moscow-Pullman Daily News, Kate Baldwin. 2006.02.07. "Rare giant Palouse worm find for UI student; months of waiting end in confirmation of unique discovery." 33204.htm. 2010.06.14: United States Court of Appeals for the Ninth Circuit affirms district court ruling. 2010.03.27: Two living individuals (one adult, one juvenile) found near Moscow, ID by UI scientists. 2009.06.30: Petition to List Driloleirus americanus as a threatened or endangered species pursuant to the endangered species act. 2006.08.18: Petition to List Driloleirus americanus as a threatened or endangered species pursuant to the endangered species act. 2005.05.27: Individual found at Washington State University's Smoot Hill Ecological Preserve near Palouse, Whitman County, WA. "The giant Palouse earthworm lives in dry, rolling hills of Eastern Washington. Both the earthworms and farmers treasure the same bunchgrass prairie with its deep, fertile soils ... which doesn't bode well for the giants. They have similar burrowing habits to their Oregon cousins [it lives near the surface when conditions are moist and tunnels as deep as 15 feet when times are dry], but have evolved to tolerate the typically drier conditions of the Palouse. Hopefully they're still there, despite the land disturbance and invasion of non-native worms." I was absolutely thrilled to see the article in the Spokesman this morning about the earthworm and ESPECIALLY that it was found on Smoot Hill. WSU administration makes periodic moves in bad budget times to talk about selling Smoot Hill. Being the only known worm location in the last 25 years should take Smoot Hill off the table for the foreseeable future. 2 - a WSU grad student found one [of] the rare Giant Palouse Earthworms at Smoot Hill Preserve west of Pullman last year. The last confirmed specimen was found in 1978. The Palouse, like many areas, is now populated primarily by non-native worm species. An overview of the Palouse subbasin wouldn't be complete unless the Palouse giant earthworm was mentioned. When Frank Smith first unearthed this giant earthworm near Pullman in 1897, he named it Megascolides americanus, thinking that it was closely related to Australia's fifteen-foot worms (Megascolides australis). Although dwarfed by its Australian counterpart, the three-foot long Palouse is certainly a giant among worms. This species, really only distantly related to Megascolides, was renamed Driloleirus which means "lily-like worm," reflecting the flowery aroma that it emits when handled (PBI 2004a). Since its initial discovery, very few other sightings of this species have been documented. The giant Palouse earthworms live in the deep, rich soils of the Palouse bunchgrass prairies. Thick layers of organic matter that have accumulated in the soils of the Palouse for hundreds of years sustain the giants during the wetter seasons. During summer droughts, the worms dig burrows as deep as fifteen feet, conserving water with specialized kidney-like organs. Farmers that arrived in eastern Washington prized the fertile Palouse soils, resulting in the almost complete destruction of the bunchgrass prairies that characterized this region by the late 1800's. The biggest threat to these elusive giants continues to be habitat destruction due to agriculture and development, but the introduction of the now widespread European earthworm has also helped to further the decline of our native Palouse worm. A documented sighting of this rare creature has not been recorded since 1978, when one was unearthed in the Palouse country of Washington State (PBI 2004). Fauci, Mary. April 2002. Palouse Giant Earthworm. Presented at the 2002 Palouse Prairie Symposium, Palouse Prairie Foundation, Moscow, ID. Frank Smith described it in 1897: "...this species is very abundant in that region of the country and that their burrows are sometime seen extending to a depth of over 15 feet." The [Columbia River] basin assessment area is inhabited by at least three native earthworm species, belonging to three genera (James 1995). Driloleirus americanus Smith was considered for inclusion in the International Union for the Conservation of Nature (IUCN) Invertebrate Red Data Book (Wells and others 1983) because its habitat was threatened and its range was not known to be large. The currently available information suggests it may be a narrow endemic utilizing a threatened habitat (grassland sites with good soil). The collection data give little detailed habitat information. The three sites (near Pullman and Ellensburg, Washington, and Moscow, Idaho, [Fender and McKey-Fender 1990]) are located in what is now agricultural land, grassland, and shrubland. Driloleirus americanus: "L" -- recommended for listing. For reasons specified in the contract reports, these species are thought to need specific protection. Figure 1, (p. 4) shows collection points for native and exotic earthworms in the Columbia River basin. Pacific Biodiversity Institute, Winthrop, WA. Endangered Species Information Network. Giant Palouse Earthworm. Overview: When Frank Smith first unearthed this giant earthworm near Pullman in 1897, he named it Megascolides americanus, thinking that it was closely related to Australia's fifteen-foot worms (Megascolides australis). Although dwarfed by its Australian counterpart, the three-foot long Palouse [worm] is certainly a giant among worms. This species, really only distantly related to Megascolides, was renamed Driloleirus which means "lily-like worm," reflecting the peculiar flowery aroma that it emits when handled. Since its initial discovery, very few other sightings of this species have been documented. The giant Palouse earthworms live in the deep, rich soils of the Palouse bunchgrass prairies. Thick layers of organic matter that have accumulated in the soils of the Palouse for hundreds of years sustain the giants during the wetter seasons. During summer droughts, the worms dig burrows as deep as fifteen feet, conserving water with specialized kidney-like organs, called nephridia. Farmers that arrived in eastern Washington prized the fertile Palouse soils, resulting in the almost complete destruction of the bunchgrass prairies that characterized this region by the late 1800's. Today, the Palouse prairies are considered to be the rarest ecosystem in Washington. The biggest threat to these elusive giants continues to be habitat destruction due to agriculture and development, but the introduction of the now widespread European earthworm has also helped to further the decline of our native Palouse worm. A documented sighting of this rare creature has not been recorded since 1978, when one was unearthed in the Palouse country of Washington State. Red List Category: VU D2. Assessed: 1996. Assessor: World Conservation Monitoring Centre. Fender, W.M. ; D. McKey-Fender. 1990. Oligochaeta: Megascolecidae and other earthworms from western North America. In: Dindal, D.L., ed. Soil biology guide. New York: Wiley and Sons. High Country News. October 16, 2006. Heard around the west. Who wouldn?t love a giant fragrant pink earthworm? A sweet-smelling earthworm, 3 feet long, would be a wondrous sight to behold, although hardly anyone has seen it since Driloleirus americanus was discovered in 1897. ... As worm defender Steve Paulson says: "What kid wouldn?t want to play with a 3-foot-long, lily-smelling, soft pink worm that spits?" Scientific American Short takes: only a scientist would brag, "I once caught a fish this small ...". March 26, 2006. Steve Mirsky. Sierra Magazine. Digging for giants -- To protect its habitat, William Fender must first prove that Oregon?s largest earthworm still exists. March/April 2003. Bill Donahue. Sierra Club. Berger, Knute. Crosscut.com: News of the great nearby. August 09, 2011. How the Feds failed Washington's great white worm. The Feds deal a blow to the Giant Palouse Earthworm's endangered species status, partly because it appears to live on in far-flung habitats. Still, the mysteries of this ice-age survivor endure, and deepen. 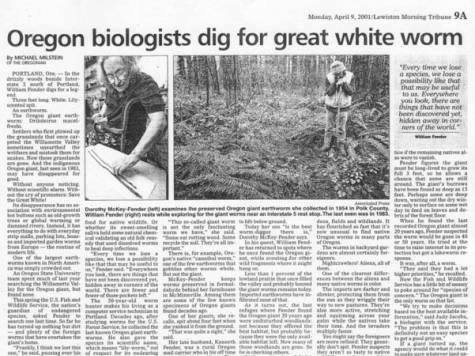 For decades, no live specimens of the large (reports of up to three-feet), white (not albino), lilly-scented [sic] (in dispute) earthworms were found, and recent finds have been major events, at least among scientists, worm experts, and Palouse preservationists. The great white worms are so rare that little is known about them: Where and how they live, breed, what they eat, what kinds of soils they require, etc. The dilemma is that unless more is known, it cannot be known whether or not they are endangered. The report turning down the GPE for listing is a fascinating document because it pulls together the state of knowledge about the worm, and emphasizes our lack of knowledge. The Spokesman-Review. Spokane, WA. November 26, 1999. The County Lines.